September 27, 2018 By Elizabeth Lindemann 6 Comments / This post may contain affiliate links. 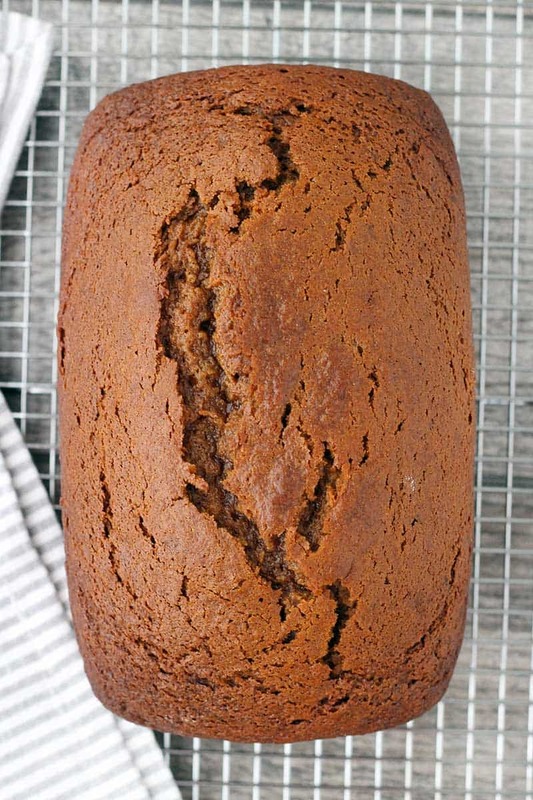 This Chai Spiced Pumpkin Bread is SUPER moist and packed with warm fall spices. It’s made with chai tea latte concentrate in the batter to make it extra yummy! It’s the best pumpkin bread I’ve ever made. In fact, it’s so nice, I made it twice. Literally, it’s in the oven right now baking because I couldn’t bear to sit here and write this post knowing that the original loaf was all gone. Here are the things I love about this recipe. It will make your house smell AMAZING whilst it bakes. It’s SUPER moist, thanks to a special trick that I’ll get to in a bit. Each loaf uses a half a can of pumpkin, meaning you can use the WHOLE CAN to make two loaves and not have any extra pumpkin lingering around in your fridge threatening to go bad. It has warm, rich flavors from both the chai tea latte concentrate and the addition of brown sugar. And speaking of brown sugar- adding brown sugar helps create the most crispy, sugary crust on the top. 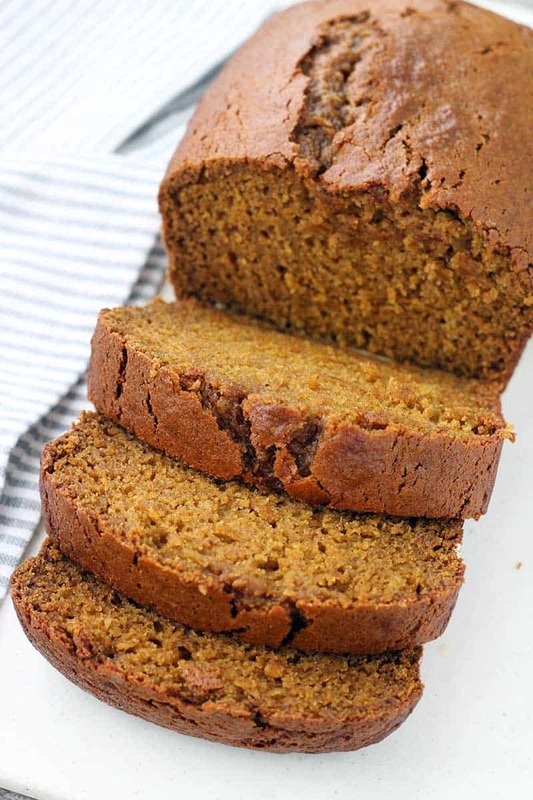 First, let’s talk about the chai tea latte concentrate used in this pumpkin bread. Because I’m about to literally put it in ALL my fall baked goods. Most pumpkin bread recipes require that you add water to the batter. Instead, I used Oregon Chai® Tea Latte Concentrate to help thin out the batter AND add a ton of concentrated spices and sweetness to the mix. I’m a big fan of Oregon Chai in my everyday life. Usually, midday, you can find me sipping on a chai latte made with it (either hot or iced) as a delicious pick-me-up during my afternoon slump. It’s packed full of flavor and I like that the company has been good to the earth and good to the community. And now that I’ve BAKED with the stuff, I don’t think I’m going to stop! It would be awesome added to pumpkin pancake batter, banana bread, muffins, GINGERBREAD… oh boy. I picked up the chai tea latte concentrate at my local Walmart with both my kids. I LOVE taking both my girls shopping- we always have so much fun looking at everything, and I’m not going to lie, it’s a great escape from the Texas heat! And you know how I love a bargain: you can save 75¢ on any one Oregon Chai® product at Walmart from 9/26/18-11/30/18, or until supplies last! Back to the pumpkin bread. And back to the trick to keeping it extra moist. It’s super simple. Use oil, not butter. That’s it! It’s a tip I picked up from Cook’s Illustrated. They tested baking a cake with olive oil and with butter, and found that butter was dryer after one day, whereas the olive oil cake stayed moist. Butter solidifies at room temperature; olive oil does not. This will help make the cake, or in this case pumpkin bread, seem more moist even after days out at room temperature. Voila! I used canola oil for this because of its neutral taste, but olive oil would also work. But while we’re on the topic of butter, I do recommend serving this pumpkin bread warm, spread with a generous amount of salted butter. Yum yum yum. Or if you want to get real fancy, you could serve it with whipped cream and a sprinkle of cinnamon! I think this would be delicious with some grated orange zest mixed into the batter. Or maybe a compound butter made with orange zest! And it’s great for an indulgent breakfast (maybe with a chai latte!) or for dessert. Finally, I recommend using a glass loaf pan. A dark colored loaf pan will retain heat more and may cause the bread to overcook on the outside. Just make sure you grease it really well and allow it to cool for at least 10 minutes before removing it, otherwise you run the risk of it sticking or falling apart. 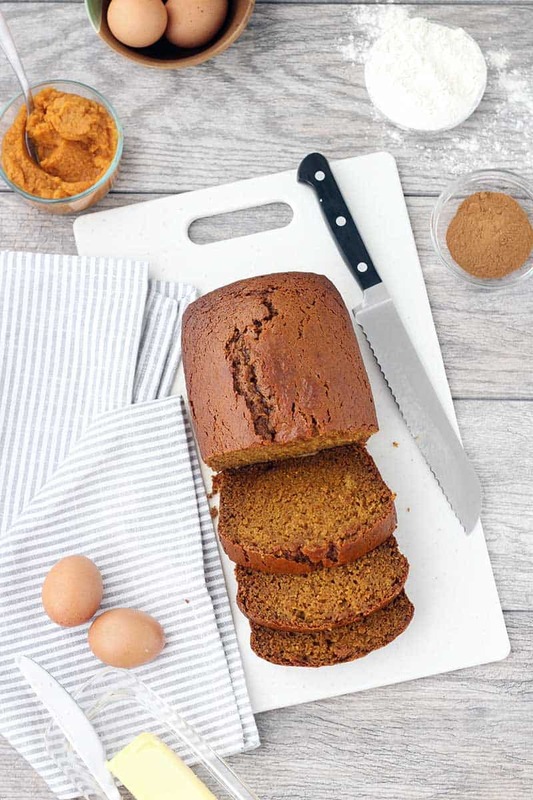 You can keep this pumpkin bread at room temperature in an airtight container for up to 5 days. 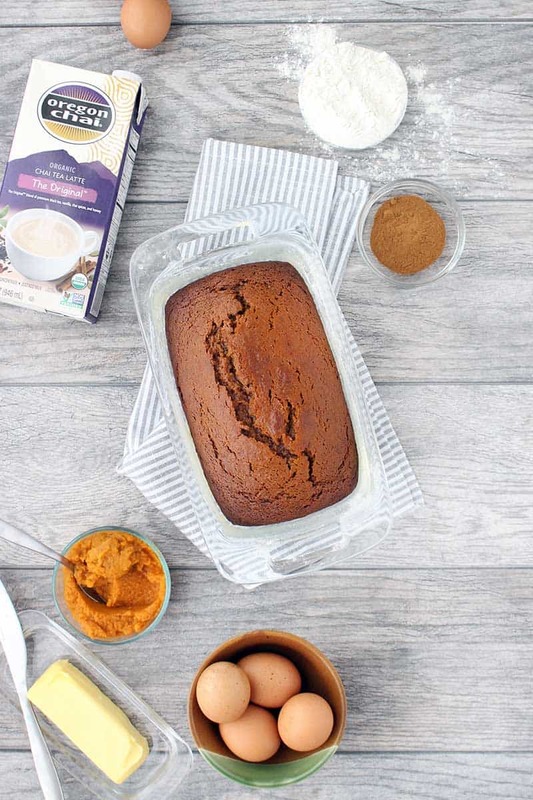 Here’s the printable recipe for Chai Spiced Pumpkin Bread! Happy baking! 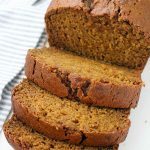 This Chai Spiced Pumpkin Bread is super moist and packed with warm fall spices! Made with chai latte concentrate in the batter to make it extra flavorful. Preheat oven to 350 degrees F. Generously grease 9 inch by 5 inch loaf pan. I like to use a basting brush to make sure the oil coats all the parts of the pan. In a large bowl, mix together the sugars and the oil using an electric mixer on high speed for about 30 seconds (until sugars are fully coated in the oil). Add the eggs. Mix together for 30 seconds to a minute on high speed until starting to get fluffy. Add the pumpkin and Oregon Chai Tea Latte Concentrate. Mix until combined on high speed (about 30 seconds). Add the baking soda, baking powder, cinnamon, pumpkin pie spice, and kosher salt. Mix again until fully combined (30 seconds to a minute). Add the flour. Using a wooden spoon, mix until only just combined, scraping down sides of bowl as necessary. Add the batter to the prepared loaf pan, using a rubber spatula to get all of the batter out and to smooth out the top. Bake at 350 degrees F for 65-70 minutes, or until toothpick inserted in the center comes out clean. Allow to cool for at least 10 minutes in pan, then remove to a wire rack to finish cooling almost completely before slicing into 8 pieces. This recipe can easily be doubled to make two loaves. If you do this, use one full can of pumpkin- even if it's not quite two cups, it will still be fine. Great recipe and definitely a keeper. The only thing I did different was to use a stoneware loaf pan. It did take a bit longer to bake but it turned out beautiful. Nice balance of spice and not overly sweet. 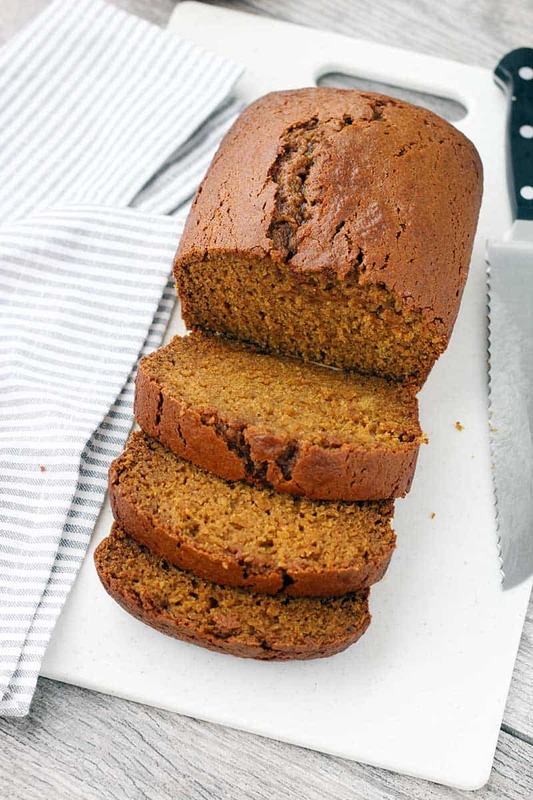 This will be my go to recipe for pumpkin bread from now on. And my daughter has also happily discovered hot chai lattes. So happy you liked it, and that your daughter has discovered the joy of hot chai tea lattes! They are my favorite this time of year. Thanks so much for the comment! A recipe that requires me to go to the store for a specific product that is a mixture of things I already have at home is a non-starter. This recipe “reads” delicious! What is your opinion to use melted coconut oil? Or is it kinda like butter and solidify at room temperature in baked goods? That’s such a great question! My guess is that it would be similar to butter, since it solidifies at room temp. That said, it would totally work in the recipe- it might just seem a bit dryer after a few days than it would with canola oil. I recommend melting it in the microwave before mixing up the batter. If you want an unrefined oil, I think extra-virgin olive oil would be great, too!